Billy was a little boy who "loved horses more than anything else in the world." Imagine how happy he was when he got his very own pony for his birthday! From that day on, Billy was seldom seen without his new friend, Blaze. Riding through fields and woods, Billy and Blaze learned to trust and understand one another -- and to jump over fences and fallen trees with ease. They were a great team, but were they good enough to win the gleaming silver cup at the Mason Horse Show? 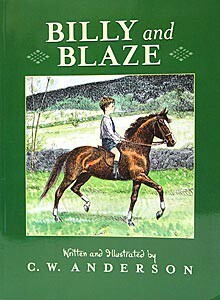 This is the first book in the classic Billy and Blaze series. Sensitive drawings and easy-to-read words capture the warmth and gentle understanding between a boy and his horse. Ages 5-8. Billy was a little boy who "loved horses more than anything else in the world." Imagine how happy he was when he got his very own pony for his birthday! From that day on, Billy was seldom seen without his new friend, Blaze. Riding through fields and woods, Billy and Blaze learned to trust and understand one another -- and to jump over fences and fallen trees with ease. They were a great team, but were they good enough to win the gleaming silver cup at the Mason Horse Show? This is the first book in the classic Billy and Blaze series. Sensitive drawings and easy-to-read words capture the warmth and gentle understanding between a boy and his horse. Ages 5-8.